Question: How can I make my wonderful manicure LAST? 1) Before painting your nails, apply some olive oil over your cuticles and your nails. This makes the polish last longer on your nails, and keeps your cuticles healthy. 2) If you have been told by a bunk bed buddy that you toss and turn at night, don't fret about your nails. This may seem weird, but wear socks over your hands at night to prevent chipping of your nails. 3) Before you do your manicure, buff your nails. This way, the edges won't seem crooked, and you won't chip anything. 4) After you do your manicure, let the polish dry for a while (around one minute), and then, run cold water over them for about 15 seconds. This leaves your polish 100% dry. 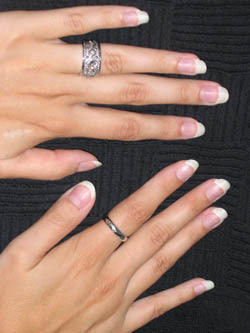 Question: How do I get a professional-looking French Manicure? I've done one before, (or not), and I want to improve it! a) For round nails, cut and shape scotch tape OR a sticky note into the curve of your nails. Stick it on the bottom half of your nails, and take white polish and apply the polish on the edge of your nail. b) For square nails, just stick the edge of a piece of scotch tape OR the edge of a sticky note on the bottom half of your nails. Take white polish, and apply the polish on the edge of your nails. c) Paint over your nails with a sheer pink polish.